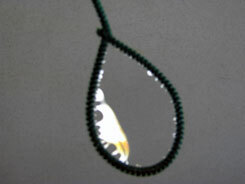 To make a bubble wand, bend the top of the pipe cleaner into a loop. Twist the end of the circle onto the middle of the pipe cleaner. This will create a "lollipop" shape. Now it's time to make your Super Science Bubbles! 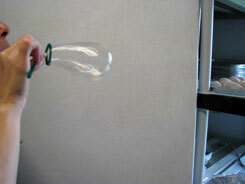 Dip your bubble wand into the Super Science Bubble Solution. Make sure you mix your bubble wand really well in the solution. Now, carefully hold up your bubble wand. You should see a thin film of solution inside the bubble wand's loop. Now, you can blow bubbles! Try to catch your bubbles with the wand. Once your bubble lands safely on the wand, it should still be intact! Take your craft stick and place it underneath your bubble wand. Try to push the craft stick through your bubble. 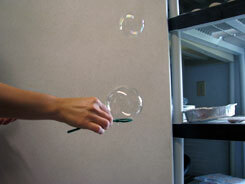 How long did your bubble last before it burst? Can you make your bubbles last even longer? Those are some Super Science Bubbles! Water is made up of lots of tiny molecules. These molecules are so tiny we cannot see them. Molecules are made from atoms, which are even tinier! In science, we call water "H2O." This means that there are 2 Hydrogen atoms (H2) and 1 Oxygen atom (O). To form the water molecule (H2O), the hydrogen and oxygen atoms hug really tight thanks to cohesion. Corn Syrup is a type of sugar. The scientific term for sugar is sucrose. The sucrose molecule (C12H22O11) is composed of 45 atoms! There are 12 atoms of Carbon (C12), 22 atoms of Hydrogen (H22), and 11 atoms of Oxygen (O11). When you make bubbles with just water, the surface tension of the bubble is not strong. Think about when you blow bubbles in the pool, the water bubbles pop instantly. 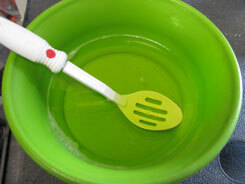 However, when you add dish soap, the water becomes more flexible. Therefore, the bubbles from water and soap last a bit longer. But, these bubbles still pop fairly soon. However, when you add corn syrup (sucrose), the bubbles are much stronger! The sucrose mixes with the water and soap to make the walls of the bubble thicker. This creates Super Science Bubbles! Now try experimenting with the water, soap and corn syrup. Can you make a new solution? How much soap and corn syrup can you add to the water? Use a measuring cup and record your findings. 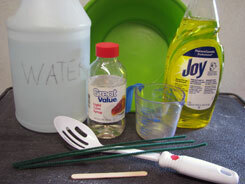 Have fun making Super Science Bubbles!